I like to travel light, and that includes having the right wallet. For a long time, I didn’t have a favorite wallet. A wallet is just a wallet to me. I’d usually buy generic ones and replace them when they break. That was the case at least, until one year, I came across a group of people who were clamoring over something at a stall at a street vendor fair. Intrigued, I also stopped by to check things out. It turned out to be wallets. BigSkinny wallets, to be exact. What’s most interesting about them is that they are marketed as the world’s thinnest wallet. Now that’s an interesting concept. I like a small, thin wallet that could fit in my jeans pocket. Admittedly, I didn’t think the wallet looked particularly stylish or unique, but it seemed practical. Made of nylon microfiber, it’s lightweight. And minimalist. Just how I like it. I bought one just to try out. I went for the zippered bifold wallet, with the thought that the zipper would be more effective in preventing items from falling out. I was quite impressed by how many cards it can actually hold. The advertised capacity is 20-25 plastic cards. When I used up all the card slots, the wallet didn’t feel too bulky to me. In fact, I liked it so much that I decided to put my money where my mouth is. I gifted my Mom one too and she had been using it ever since. While the wallet itself held up quite well to the test of time, I will say that zipper part of it didn’t fare quite as well. 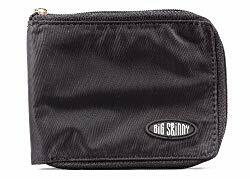 If you prefer a non-zippered RFID blocking wallet, Big Skinny has it too. If you like leather styled wallet, that is available too. However, not knowing if the leather version would add more bulk, I decided to stick with the tried and true. I’d like to try out the tri-fold option at some point, since the company offers a few slightly more stylish options for women. Maybe next time. When my wallet eventually broke (not so much the wallet itself, but the zipper), I actually replaced with a Swiss wallet in the same style. It was too bulky. It just wasn’t the same. I decided to go back to the BigSkinny wallets. Yep, I answered. She likes the wallet and commented that it’s a good wallet, even though zipper is already broken. But, I know she’s quite pleased about getting a new (same) wallet soon. The post The BigSkinny: World’s Thinnest Wallet for Travel (and Everyday Use) appeared first on TravelUpdate.